Corn futures are trading solidly higher at midday. The market is being supported by declining yield and production ideas and outside market strength. USDA will update crop condition ratings this afternoon and dry conditions in the central Corn Belt could further lower ratings. Strength in Dow Jones futures and crude oil and weakness in the dollar are also supportive factors. September is 7 1/2 cents higher at $7.60 and December is 6 3/4 cents higher at $7.73 3/4. Soybean futures solidly higher at midsession. 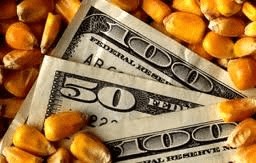 Fund buying is being driven by concerns about lower than previously expected soybean yields and production. Dry weather in the central Midwest is trimming yield potential and could weigh on crop condition ratings this afternoon. Outside markets are helping to extend the gains as the stock market and crude oil are trading higher while the dollar index is lower. September is 21 1/2 cents higher at $14.36 1/4 and November is 21 1/2 cents higher at $14.45. Wheat futures are trading higher at midday. Spillover strength from corn and soybeans and weakness in the dollar index are supporting wheat futures. The disappointing spring wheat yields and ideas that drought in the southern Plains could limit HRW seeding and emergence this fall. However, some rainfall over the weekend in the Plains has at least temporarily eased those concerns. CBOT September is 2 3/4 cents higher at $7.65, KCBT September is 3 1/2 cents higher at $8.69 1/2 and MGE December is 6 1/4 cents higher at $9.43. Cattle futures are trading lower at midday. Weakness in boxed beef prices and concern that cash cattle and beef markets will be on the defensive until after Labor Day are weighing on futures trade. Choice cutouts were down $1.49 and select cuts were $1.78 lower on Friday. Further losses are being limited by strength in the stock market this morning. October is 35 cents lower at $114.85 and December is 28 cents lower at $116.83. Lean hog futures are lower at midsession. Lower cash hog and pork prices are weighing on futures trade. Pork cutouts were down 32 cents on Friday and ideas are for softer cash and pork cutout prices this week ahead of the extended Labor Day weekend. Cash markets were steady to $1 to start the week. Losses are being limited by the already big discount to the cash market and due to strength in the dollar. October is 20 cents lower at $86.90 and December is 45 cents lower at $84.13. « Early price peak for corn and soybeans?